Rockland opened its conference play with a four-game series sweep of Westchester last week. 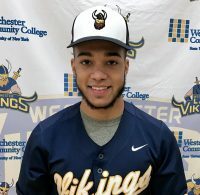 In the first game last Thursday (April 3), Rockland was down 10-4 going to the bottom of the fifth inning before scoring 10 runs to fashioned out a 14-11 win to open its conference play. Andrew Guerra went 2 for 4 with two RBIs and two runs scored. Stephen Greeley and Frank Margiotta recorded two RBIs each. Joseph Ottaviano recorded his first win in relief allowing one hit with striking out four. Raymond Pacella recorded his first save of the season. Rockland then travelled to Westchester on Saturday, April 6, for a doubleheader. In the first match, Rockland capitalized on four errors by the Vikings to win 7-5. John Daly went 2 for 5 with two RBIs and two runs scored. Mario Zamora recorded his second win of the season pitching five innings allowing two runs while striking out four. Raymond Pacella recorded his second straight save. In the night cap, Rockland scored 4 runs in the 1st inning and never looked back, winning 15-3 in a mercy-rule five-inning match. Kenneth Hoppe went 3 for 4 with three RBIs while James Costin went 2 for 4 with three RBIs and two runs scored. Miles Kelly hit a home run to drive in two runs. Hunter Semmel drove in two runs. John Daly and Raymond Pacella recorded two stolen base each. John Freeman recorded his fourth win. Rockland hosted the final game of the series on Sunday, April 7. Raymond Pacella allowed only four hits and one run in six innings pitch while John Daly drove in three runs to lead the Hawks to a 11-1 six-inning game win and the series sweep. Stephen Greeley hit a homerun and drove in two runs while Michael Pavelchak went 3 for 3 with two RBIs and two runs scored. Rockland (4-0, 15-7) will host Morris on Tuesday, April 9 and College of New Rochelle on Wednesday, April 10. Rockland is back on conference play starting Thursday, April 11 with a four-game series against Sullivan County Community College. For schedule, click here.